Back To The Future 25th Anniversary Tour! Okay, so I love these movies. Something about time travelling, I just get a kick out of. I've seen these movies so many times, it's sickening. Maria and I decided that we would love to scout out all the location spots where these movies (especially part one) were filmed and then document (take pictures)of them. Bookmark this blog because we will visit these places in the next few months. 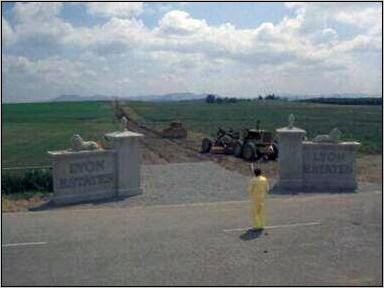 To my surprise, I live 15 minutes away from the 1955 Lyon Estates entrance (that was not fully constructed in 1955). It's the scene when Marty drives down this street and he screeches to a halt after seeing the Lyon Estates Stone statues. I went back to the 1955 Hill Valley location today - and the gate that kept me out from before was now open and I got all the correct shots. Notice the mountain range in the background matching the still shot from the movie. And I found it funny that the street that lead me here was Pine Ave. Fitting. Whittier High School & Uptown Whittier.